Are you looking for a safe and cost-effective way to replace your old or broken brake calipers? 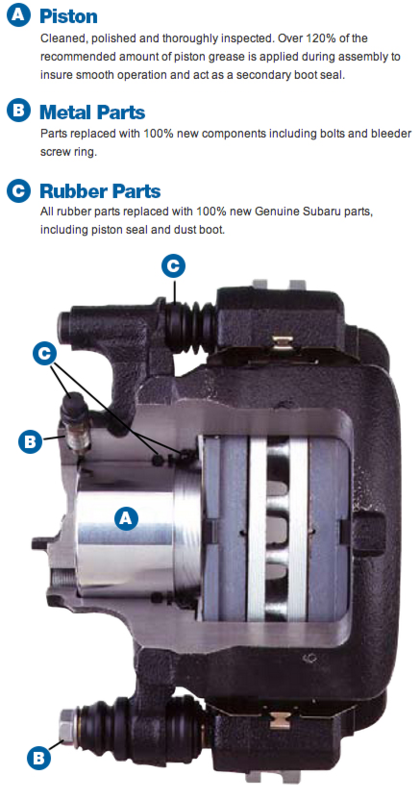 We recommend choosing Subaru remanufactured brake calipers, which you'll find here at Subaru Superstore. 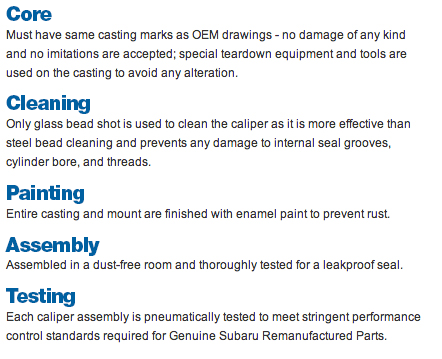 In order to line up with strict OEM Subaru standards, Subaru remanufactured brake calipers undergo a stringent re-manufacturing process complete with cleaning by glass bead shot, enamel painting to prevent rust, assembly in a dust-free room, and thorough performance control testing. The caliper piston itself is thoroughly cleaned and polished while parts subject to wear are totally replaced with genuine Subaru parts. With such a detail oriented process, it's clear that Subaru remanufactured brake calipers are a safe way to get like-new brake calipers without the cost and waste of purchasing completely new ones--get your Subaru remanufactured brake calipers near Phoenix at Subaru Superstore.